Blakeney is a pretty unspoilt village on the North Norfolk coast popular with holiday makers. There is lots to do & see in this stunning unspoilt part of North Norfolk and lots of great places to eat & drink locally, many within walking distance of Gardeners cottage. In summer the Quay at Blakeney is full of sailing boats & children play at low tide in the water. At high tide the quay is great for crab fishing. Blakeney is also very popular with artists, bird watchers and photographers, and there is a photo opportunity at every turn. Discover the narrow alleyways known as ‘lokes’ leading off the High Street, filled with hollyhocks each summer leading to the traditional flint cottages. 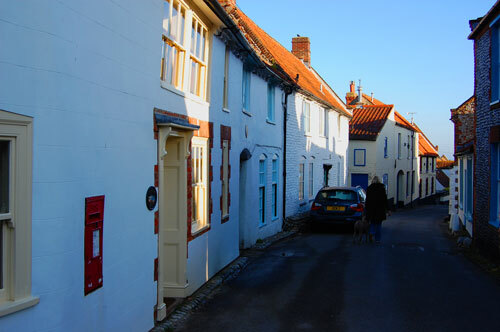 Blakeney is also well known for its pretty traditional fishermens cottages, many of which are now holiday cottages. Mix in the appeal of boating and wildlife, legendary tales of piracy and smuggling and you have Blakeney...., probably the most attractive village on North Norfolk's fabled heritage coastline. Blakeney is very popular with sailors and in summer the quay is lined with families crab fishing and children playing, swimming and mud sliding in the water. The coastal path has now been fully repaired and is more popluar then ever and you can once again walk to Cley or Morston. There is an abundance of wildlife here and in particular wild birds. Many people also just come to sit in their car and look at the beautiful views and watch the activities on the water. Weather you just want a crab sandwich and a cup of coffee or a full sit down 3 course meal with wine you will be well catered for in Blakeney with lots of great places to get food all withing less than 5 minute walk of the quay and of Gardeners Cottage. Blakeney Point has the largest colony of grey and common seals and boat trips leave regularly from Morston and some from Blakeney. Seal trips can be booked at Blakeney Quay in high season.